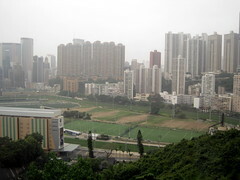 Our third morning in HK dawned bright and sunny. We thought we would have a fine day for our trip to the Peak, the territory’s highest point, but before long the grey clouds were back. At any rate, it didn’t rain. After our discovery of iSquare the night before, we headed over there in hopes that one of the eateries would be open for breakfast, but none were — though someone was setting out trays of enticing treats at Panash. Instead we set out to meet Caroline. She’d struck up a conversation with a man who worked at a tailor shop, so we ended up spending a fair bit of time there as I talked to the designer and weighed whether I wanted to have a dress made. As soon as we started planning our HK trip, I said I was going to get clothes made, but the more research I did into it the less worthwhile it seemed. 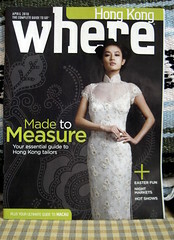 HK tailor-made clothing used to be very cheap, but it’s not anymore. At $200 and up for a dress, you can’t just walk in and ask them to make you something; you have to check them up beforehand and make sure you’ll really be getting what you pay for, and you have to really consider what kind of garment you most need. So I’d pretty much decided by the time we got there that I was going to give up on the tailoring idea, and just speed up my plans to learn to make clothes myself. Then, in the hotel, there was a tourist-info magazine with an article all about tailors, and that got me a little bit excited about the idea again. So when Caroline turned up with this tailor guy and we went into the shop, I was seriously considering the possibility of a dress. I looked at designs and fabric samples, and asked questions of the designer. He was polite enough, but he didn’t seem very interested; it was clearly a job for him, not a creative project. He never asked where I was planning to wear the dress, and he didn’t even look at my body shape to see whether the style I chose would be flattering. So that was a little off-putting. Then the fabrics he brought out were just not inspiring. He kept taking out sample books of thin Chinese silks, and they all looked like they’d make kind of cheesy dresses: phoenix motifs and stuff like that. I asked for colorful prints, and those didn’t look much more modern. The entire shop had clearly a strong menswear focus. So the fabrics gave me pause, too. Then Caroline or Erik asked how much a dress would cost (I hadn’t mentioned it), and it turned out I couldn’t get one for less than $300 or so US, and even that would be for only the simplest designs. Well, never mind then! We took our leave. When we emerged onto the sidewalk the original guy was back at his post. I must say all the tailors’ touts we saw were impeccably attired! We realized we were running late to meet Joanna, so we hurried into the MTR station to buy and scarf down a couple of buns as we did so. I’ll get into the fabulousness of the MTR at some other date, but I’ll just say for now that every station had at least one bakery in it, and you could pay by just touching your transit card to a sensor. So getting a snack was fast, cheap, and easy as could be. I wish they had that here!! 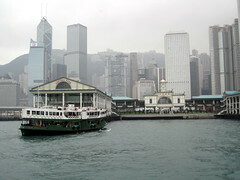 Then we popped out of the station at the other end and trotted to the Star Ferry terminal to catch our boat. From my American experiences I’ve always been under the impression that taking a ferry is kind of a big deal, but here it was just like catching a bus. Boarding was easy and quick, and it was an equally rapid 5-minute trip across Victoria Harbour to Hong Kong Island. No time to get seasick, even. 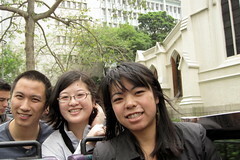 We met Joanna at the IFC mall and then took a taxi to the Peak Tram. 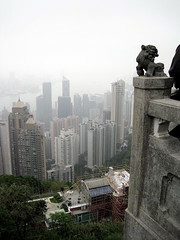 There are other ways to get to the Peak, but the tram is the quickest, an approximately seven-minute ride. The tram (actually a funicular) has been in continuous operation since 1888, a fact I’m deeply thankful I didn’t know before I boarded it. The ride is so steep… I was not thrilled, and refused to look down. But the view from the top is pretty spectacular, even on an overcast day. We did a bit more picture-taking and some shopping, then enjoyed a really lovely (and slightly chilly) lunch out on the terrace at the Peak Lookout, the Peak’s oldest restaurant. It’s probably one of the most attractive, appealing restaurants I’ve ever been to; it must do a ragingly successful wedding business! I will always remember it as the first place I had Hainanese chicken rice. 😉 Glorious dish! I’ll take this opportunity to say that every meat we had in HK was ridiculously tastier than its US counterpart; the Hainanese chicken had as fresh and fat a texture and flavor as the expensive free-range organic birds we’ve bought at the natural grocery. Joanna says meats in HK are much fresher than in the States; it must be true. I wonder what the logistics of the meat industry are in Asia, and how they differ from the situation here. 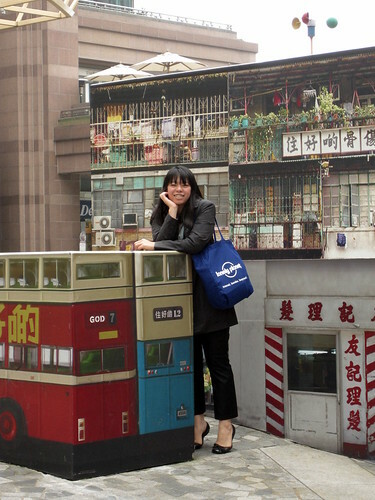 Taking an open-top double-decker bus! Caroline had to return to Central after this for her friend Denise’s hen party (bridal shower/bachelorette in the US! 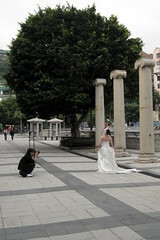 ), so Joanna took Erik and me on a long, picturesque bus tour of the southern coast of Hong Kong Island. We rode on the top deck (thankfully not open this time) of a double-decker bus as it twisted and curved its way around mountain roads. It was a bit scary, but the views were amazing. We passed through Wan Chai, Happy Valley, and Repulse Bay before stopping at Stanley; on the way back, we took a different route and saw the Ocean Park area, Hong Kong University (where Debbie works), Aberdeen, the Jumbo floating restaurant, the freeway, rush hour traffic, and the mall where we’d gotten off the Airport Express on our first night. All this for less than $1 US, round-trip! After seeing HK from the ferry and also on foot, it was a totally different experience to see it from the road too. 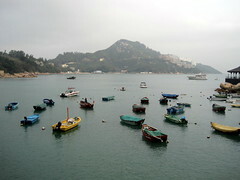 In between the bus rides, we also got to explore bits of Stanley and Repulse Bay. We made a cursory jaunt through Stanley Market, a less raucous version of the Ladies’ Market, and took a pleasant walk through Stanley’s waterfront Main Street. We walked through, but didn’t enter, the Maritime Museum, located in Murray House, a 164-year-old building with an astonishing history. Apparently the landmark was torn down in the early 1980s, but the government reassembled the building years later in Stanley — brick by brick, except that they’d mussed up the plans and labelling, and had to painstakingly reconstruct it during the relocation. The guidebook says that they still ended up with a handful of columns they didn’t know what to do with, so they stuck those along the side of the building, where we saw wedding photos being taken during our visit! I love history like that, but my favorite part of our afternoon was visiting what Erik dubbed The Kitchen Sink of Good Fortune. 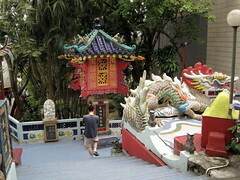 Joanna took us to a funny place in Repulse Bay that was filled with statues and auspicious decorations and structures of all kinds. Apparently it’s actually called Kwun Yam Shrine and is a Buddhist shrine built largely during the 1970s. It’s a happy jumble of colors and forms, and I loved it. It was like being in one of my drawings! After the long traffic-slogged bus ride back to Kowloon, we staggered into a seafood restaurant for dinner — I think it might have been this one. Joanna treated us in fine Cantonese style: we went to the live tanks, and she selected a whole garoupa, a crab, and many large prawns, all of which were lifted from the water, wriggling, for our inspection. I almost cried when I saw the prawns waving their antennae and the garoupa shaking its fins. The crab’s legs were strapped down or they would have reached out too. It seemed so awful to pry all these creatures from their (miserable, in-tank) existence just so we could have them for dinner. On the other hand, they were extraordinarily succulent, and as Erik says, there’s no point feeling bad for these particular animals, because if we didn’t eat them someone else would. I am not one of those people who thinks humans aren’t meant to eat animals — humans are meant to survive by eating whatever we can — but it’s still quite grim to be reminded that eating omnivorously means partaking in death. I’m not being melodramatic. One moment we were watching these live creatures swimming in their tanks, and a few minutes later we were prying them from their shells or bones and sucking them down (and, as I say, they were delicious). If I return to being vegetarian, this will be a big reason why… and until then, whenever I do eat meat, it’s good to remember where it came from. Anyway, eat these creatures we did, and it was such a tasty and absorbing feast that even though the restaurant had enormous windows and we were there during the Symphony of Lights, we missed it completely. Quite honestly, aliens could have swarmed on Victoria Harbour, and we wouldn’t have seen a thing. Afterward, stuffed, we made our way back to the hotel and went to bed. Click to see the whole album! It’s huge for this day; we saw a lot of stuff!